We have combined the most advanced technology with effective design to bring you a web site solution that will increase lead generation, improve customer satisfaction with powerful tools and content, and be a key asset to your marketing effort. The sites are fully customizable from top to bottom as well. We know life is full of hard decisions, but this time we’ve made it an easy one (well, you still have to pick the style and color, but we can help with that too). Your web site comes pre-built with compelling content. In addition to having the most professional looking web site - you will have the best written content. Page content is customizable to fit your business needs. Submitting to search engines is the first part of battle. Next you will need to optimize your site for specific keywords. Your web site will come with advanced yet easy to use calculators to help your borrowers, and to provide 'stickiness' to your site. Your web site comes pre-built with compelling content. In addition to having the most professional looking web site – you will have the best written content. Page content is customizable to fit your business needs. Your website includes a complete email solution as well, with 10 GB of storage per email box and 50 MB attachments. In today’s busy world it is often hard to reach people. You might be on the phone or in a meeting and your borrower can be in the same situation. By providing your borrowers loan status online, they can check their status at their convenience. If you work with realtors or other professionals that refer loans to you, they often want to know the status of those loans. With our referral loan tracking, they can login and view the status of the loans that they referred to you. First you need a professional looking web site (if you have a badly designed site or a cookie-cutter design, you can have great content but a lot of borrowers won’t bother to read it, because they won’t trust doing content from a poor looking site). In addition to having a top of the line design, we provide you with whole library of compelling pre-written for your site. Your web site will be ready to go with pages of compelling content as soon as you sign up. But of course you might want to personalize your site. If you have special programs you want to emphasize or if you just want to change some text to fit your company’s style – it’s your choice. You can add pages, change text and add text, images, buttons, links, menus, embed video, tracking code, and even add documents. Of course or content management system is easy to use! Add Links to your partners web sites! With our premiere package you can customize your homepage flash presentation to fit your company’s image. You can select from a variety of images, and change the text to fit your company. Please note: we do not endorse flash introductions as this is not something you see on professional business web sites (they are more suited for a movie or rock band), initially the idea of a flash intro might seem like a neat idea but forcing a potential borrower to view is not a smart business and actually doesn’t deliver results. Trust us on this one we know web design and we know how to build sites that deliver results. Rise above your competition with a real corporate site! Add a password protected zone to your site, great for restricting access to sensitive company training materials, or for forms and documents used by clients. A great way to increase traffic to your site, increase your search engine and improve your business networking is by using our Business Partner Referral Network! When you purchase one of our web sites you are going to have the most compelling content available with a wide variety of relevant pages like: purchasing, refinancing, imperfect credit, the list goes on but you might have a special niche or program that we don’t have a page pre-built for. In addition to adding pages, you might have specific documents for your borrowers (or business partners) to view – that is why we make it easy to add to documents to your site – no need to worry about email spam and virus blockers – plus they can access files 24/7! With your new site, you will be able track your web site visits and statistics. You will be able to see how many visits you get each day, month, even the time of day. One of the great features of our premiere sites are the loan officer mini-sites. Each one of your loan officers can have their own unique web presence. This helps build loan production, helps lo’s marketing and even company morale. Marketing your site online is a crucial part of your web site success. We help you market with each package. Our premiere package features advanced tools such as our Business Partner Referral Network, Banner ads and more. With our premiere package you be able to have banner ads to help your internet marketing efforts. Banner ads are set to industry standard sizes for easy implementation. If you have multiple-branch office and would like visitors to be able to apply directly with a specific branch and view each branches loan officers and staff then the multi-office site add-on will be perfect for your site. If generating leads is the primary goal of your site, then you have come to the right place. Lead Generation is both and art a science. This means you need technology but you also need design. Anyone can read a book and build a web page with a form, but of course not anyone can build a page with design and content that compels higher form completions or phone calls. You need to move past flash buttons and scrolling text. Our pages use the science of color, placement, advanced user interface and design that establishes credibility and calls to action, resulting in higher lead generation. 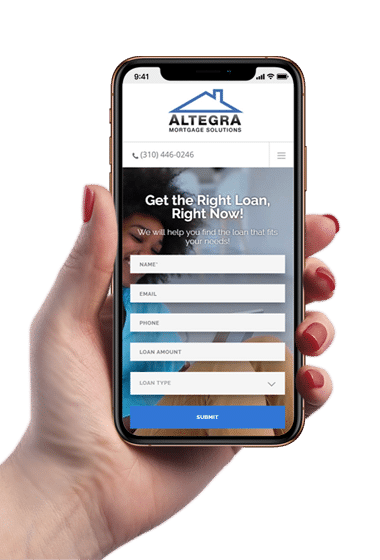 Your web site will come with advanced yet easy to use calculators to help your borrowers, and to provide “stickiness” to your site. Which Loan is right for me ?